@AnderKaver: Marussia's Russian sponsor basically pumped enough money into the team so it could make the Russian Grand Prix last month. After that, it appears he just lost interest completely. The sponsorships were announced last year but there hasn't been much more said on them since, which is often the case in F1. @raj: Indeed, and an impressive effort too when you hear about the financial shape of Force India compared to McLaren et al. Massa has jumped into P1, dipping into the 1:39s for the first time in this session. His time a 1:39.820. Hi Nate, good eve. Just enough rumors. Why did Bernie say only 14 cars could be on the grid in 2015? @rockedin123: Bernie is Bernie. Usually he has an agenda behind what he says but it's hard to know his motivation behind that one. Nate if you could bring two teams which has left the sport in the past 10 years, which would they be ?? Why are the results of FP2 still up on the screen? @Satyaban: We're currently having a technical issue and working to resolve it. Apologies. Ricciardo has jumped into P2, two tenths off Massa. Grosjean, who has the 2014 nose back on his car after running next year's model in FP1 yesterday morning, slots into fourth... but he won't stay there long with lots of the top runners still to go. Kvyat continues to impress, he's third - seven tenths off Massa. These times all on the medium tyre so far. Ricciardo completes a fresh lap and he goes P1, shaving two tenths off Massa's time. Bottas goes purple through the first two sectors but loses a bit of time in the final sector as he goes second by less than a tenth. may be we should ask bernie to create his own team and bring it in f1 and try to run it.perhaps then he will realize the problems of the smaller teams..
@Salman: Somehow I don't think money would be an issue for Bernie. Neither Mercedes have set a time, and are still sat in the garage. Kvyat complains about something on his elbow disturbing him. Interesting radio complaint there. Nate that i know but money doesn't bring you success every time..look at ferrari and mclaren this season.if you can't earn much then you would be foolish to spend big. Alonso goes fourth with his first significant run. The top five for you - Ricciardo, Bottas, Massa, Alonso, Kvyat. Only the Merc boys yet to set a time. Vettel is bottom of the timed runners once again by a big margin but he is working on high-fuel, long run pace ahead of tomorrow's race. He is set for a pit lane start, remember. @Parth: Raikkonen is sixth, nine tenths off the lead. @nate Where do you see Alonso ending up next year? @hash: McLaren, personally. I can't see Ron Dennis passing up the chance to re-sign him, whatever the history between them. He knows if there is any man who can get the most out of McLaren next year, it's the Spaniard. Alonso loses the rear coming into Turn 12 but manages to save the car before it spins. Track looks a little slippery out there. have you tried one of those huge turkey legs (BBQ)? @FlyingFinn: Not yet. On the to do this. Mclaren has a spanish web page - a clue?? @750k2: I saw several media outlets make a big deal about this earlier in the week. They've had that feature for about two years, so I wouldn't read anything into it. I know he used to run a team, but its essentially a completely different sport now. Rosberg emerges from the Mercedes garage. 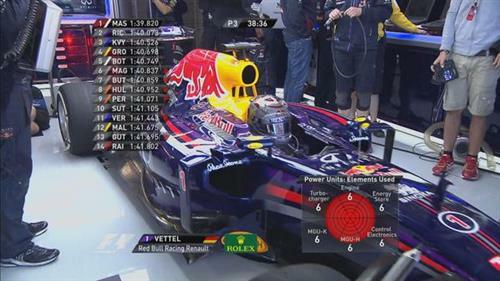 Ricciardo has gone P1, lowering the benchmark to 1:39.693. We now have the FP3 timing screen issue resolves. Sorry about that, chaps.